Buying gold this Samvat: Is it really a good idea? This piece considers whether buying gold every Samvat is a good idea, if we discount the sentimental value attached to the precious metal. For traditional Hindu families, no Diwali is complete without buying gold in some form or the other. Do you have any idea about the quantum of gold that Indian households have? You will be surprised to know that they hold close to 24,000 tonnes of gold, which is worth nearly $1tn. That is nearly half the market capitalization of the Bombay Stock Exchange and nearly 40% of the annual GDP of India. 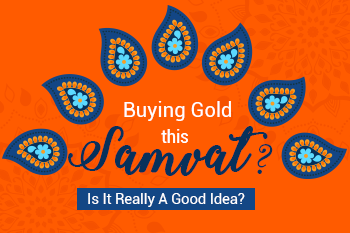 With this kind of gold in their possession and an annual demand of close to 800 tonnes of gold, the following basic question arises: Is buying gold every Samvat really such a good idea? There are two things we need to understand at the outset. There is a sentimental demand for gold in every household and an investment demand that views the yellow metal as an asset class. Here, as prudent investors, you must look at these two things differently. Let us focus on whether and why gold as an investment product adds value to your portfolio. How can gold help in wealth creation? Most of you look at gold as an idle asset to be left in your lockers. If you track the historical prices of gold, it is a lot more than that. For example, between 1971 to 1979, gold moved from $35/oz to $850 an ounce. Similarly, gold bottomed out at around $440/oz in 1999, but by 2011, it had touched a high of 1900/oz. Does gold really qualify as part of your financial plan? The answer is “Yes.” When we include gold in our long-term portfolio, the idea is not to outperform the market. The focus is diversification as opposed to enhancing returns or wealth creation. Gold is not a productive asset as it does not earn anything nor does it generate any returns. But, it is a good protector of portfolio value over longer periods of time. Also, it gives a commodity flavor to your portfolio. Gold has typically outperformed during times of turbulence and uncertainty. Insecurity could either be geopolitical or economic. Political uncertainty in the form of the Cold War and Middle East strife were all reasons for the sharp rise in gold prices. Similarly, economic uncertainty during the post-Lehman period was a time when all asset classes were depleting. Take the period 1971-1979. The Gold Standard had collapsed, Israel was fighting a series of wars in the Middle East, Saudi Arabia had imposed an oil embargo on the US, Iran was battling Iraq, and Russia had invaded Afghanistan. During this period, gold rallied from $35/oz to $850/oz. What’s more, this period remained one of the most frantic movements in gold prices in a short span of time. Between 2006 and 2011, a combination of the US sub-prime crisis, collapse of Bear Sterns and Lehman, and the European debt crisis made gold extremely valuable. Gold surely holds value and certainly appreciates during uncertain times. What happens when central banks keep printing currency as they did during the post-Lehman period? Fiat currencies like the dollar, Euro, INR, and Yen are issued based on a fiat by central banks such as the US Fed, ECB, RBI, and BOJ, respectively. There is no limit to the amount of currency that these central banks can issue and such reckless issuance of notes can be inflationary. When there is too much currency chasing but marginal goods, you have reckless inflation. Not only does that deplete purchasing power but also makes these paper currencies worth a lot less. Gold, on the other hand, is a non-fiat currency that has limited supply. This is also a strong case for including gold in your portfolio. The importance of gold arises from the fact that gold prices tend to have a low correlation to the movement of debt and equity. In times of strife, even equity and debt returns tend to converge. Gold has a low correlation to equity and bond prices and hence including gold in your portfolio gives you a natural hedge. However, gold is not a return-generating asset over the long run; thus, the exposure to it should be limited to a maximum of 10-12% of your total portfolio at all times. So, should I buy gold this Dhanteras? Gold jewellery normally has an emotional value, and it is hard to take an investment call. But if you are holding physical gold as an investment or as a hedge against troubled times, then you must look at a more efficient method of holding like e-gold, gold bonds, or even gold ETFs. After all, it has been the longest surviving secondary market, and gold never goes out of demand. That is what stability is all about. Have an exposure of 8-12% to gold and tweak within these limits. You could actually be better off!